One more year has gone. Enactus mansoura bid farewell five of its future leaders who spent their time and potentials in the place. 1) Abdulaziz Boghdady as the chairman of the board. 2) Mahmoud Shousha as the vice president. 3) Ahmed wafaa’ as the project director. 4) Sherif Elbaz as the human resources director. 5) Kareem Zaen as the finance director. Starting from Abdulaziz Boghdady ending with Kareem Zaen, they all did great job as sincere hard workers by which Enactus mansoura will always remember them. 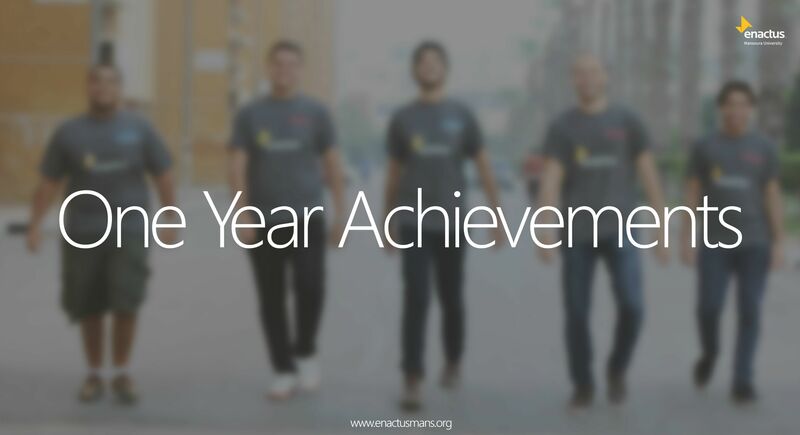 First of all, Enactus mansoura had poverty in manpower though they wouldn’t allow anyone to join Enactus mansoura. They started doing firm recruitments looking for certain criteria to be trained to the fullest to become in charge of improving the place. They started doing projects with plans and timeline. Their target in every project was “THE NEED” They began to search on needs and how to fill them without being repeated. They established a strong structure for Enactus mansoura with dissuasive sanctions as everyone in his position only doing his task. Everything was calculated accurately to improve the place. Although his role as the chairman of the board was purely administrative, he worked in every project and took into account all the details even the smallest one. He did a magnificent effort to maintain the place and to improve it. He faced a hindrance in his way as there was no infrastructure for the place. He wanted to replace the paperwork with a technical one. He worked with “Amr ElNaggar” the IT team officer to develop the database as for every member there’s an account containing the points he gained. Beside being a successful vice president he was the presenter of Enactus mansoura in the final competition. One of the most dedicated broad visioned projects’ director enactus has ever witnessed. Not only did he manage to initiate and keep the sustainability of the projects but he had a vision for each one. For the most sustainable project, mini dollars, he initiated a summer school with teenpreneurs team to gurantee the sustainability of the project for the upcoming years. He also had a very effective role in the preparation for the enactus National Competition where he worked on the analytics part and revising all numbers and statistics the team had achieved through the projects all year long. As a board member responsible for the HR he built a good database for members through tracking, evaluation and activating our points system. He also changed most of the work to technical work instead of paper work. Along being a successful board member, he was the manager for the project empower. The project achieved great milestones and was one of the projects presented in the enactus National Competition later this year. Although his post was controversial, it didn’t stop him from adding another achievement to the board. His first challenge was to establish a fundraising team to raise fund to the treasury. And he did it! He established the strongest fundrasing team in mansoura. He did it from the scratch as Enactus msnsoura never had that kind of teams before. Then it comes to “تذكرتك مشروع” concert which was a milestone in the history of enactus mansoura.Everyone said they won’t be able to make it. They suffered the toughest circumstances in their way But after all with the help of the board and the old members they were able to make it. As he always told the team “Enactus mansoura leads and others follow”.